for the government, small, medium, large enterprise organizations and their clients. Need immediate delivery? 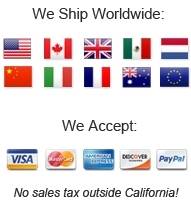 We have over 8 million computer and network hardware parts in stock at various locations throughout USA, ready to ship today. This means that you can count on Econram any hour of the day or night! What can Econram do for you? Pre-Sales Technical Advice - Our top priority is to make sure that you receive the right product. Your Econram Sales team will work with you to optimize any existing system with genuine parts and accessories. We will get you up and running and will walk you through the installation process. Systems Engineering & Integration - Our techs will configure all network hardware, storage systems and data servers to your specifications. Specific system configurations and the proper integration of components and appliances are vital to your data center environment. Take advantage of our full range of installation and configuration services available throughout 36 countries. Discontinued and Obsolete Equipment - Allow us to quickly source and deliver Legacy, EOL (end-of-life) and hard to find parts. This is our specialty! Everything you need to maintain, support and supply effective solutions for your Data Center.